Camping is a super fun hobby, allowing you to enjoy the great outdoors get one with nature and works wonders in building strong family or friendship bonds. Unfortunately, the expense of the dozens of types of gear that you need to make a successful camping trip can really add up. It’s not enough that you have to pay for the tent for camping – you also need to find a good sleeping bag, (or in this case a good double sleeping bag) a backpack, a campstove, and more. Plus, there are often fees required for campsites as well as related travel costs. These expenses are often enough to put a damper on even the most low-budget trip. 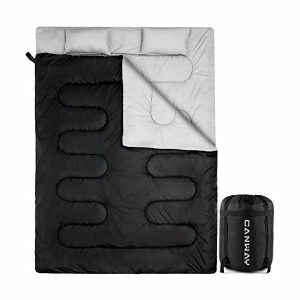 Luckily, one of the best double sleeping bags, the Premium Quality Double Sleeping Bag by Canway, offers you comfort, versatility, and style without requiring you to break the bank. This attractive sleeping bag might be low in cost, but it doesn’t sacrifice quality or appearance to save you money. Made out of 210T polyester and with a durable flannel liner, this sleeping bag will keep you warm and comfortable even in damp or chilly weather. 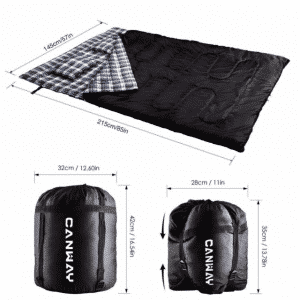 The sleeping bag is waterproof in damp environments and is quick to dry in extreme conditions. With ultrawarm 3D cotton filling, the bag is a great choice for all seasons. The double sleeping bag is queen-sized, with dimensions of roughly 85 by 57 inches. It weighs less than seven pounds, making it ideal for carrying over long distances. It even comes with two pillows so you don’t need to worry about lugging around extra gear. Everything you need is built right into this one handy piece of camping equipment. This double-wide sleeping bag compresses to a compact size for carrying and has the unique benefit of conversion. You can easily stretch this sleeping bag into two separate bags by using one of the double-sided zippers on either side of the bag. This is an excellent feature, because it means you can use the sleeping bag on both solo and partnered camping excursions. That being said, when zipped together, the bag can hold two adults of up to 5’9” and 180 lbs each. The bag is not only easy to carry and use, it is also a cinch to clean. They are safe for standard washing machines and even come with free compression bags and carry straps. It is great for carrying on its own or even in a pack if you are headed into the backwoods. This double sleeping bag has received rave reviews from customers who appreciate its durability and ease of use. It is machine washable and incredibly soft, making it a good option for a budget shopper. It is soft and comfortable, making it a great bag to slide into after a long day of hiking or exploring. Customers love how warm these sleeping bags are. Because they have a waterproof, weather-resistant design, they protect you from most dampness. They are equipped with double-filled technology and S-shaped quilted design, unique features that help you stay warm on the coldest, stormiest nights of the fall and summer months. That being said, unlike many all-seasons sleeping bags, which are sweltering in the summer time and drafty during the winter, this sleeping bag offers comfort for all seasons. It is lightweight, waterproof, and weatherproof but doesn’t suffocate you like many heavier double sleeping bags. This sleeping bag for two is roomy enough for two adults and is thin without being bulky. It can easily be packed into a compression sack and carried wherever you would like to go. Furthermore, customers report that this product really lasts, with some reviewers having used it dozens of times and reporting no problems at all. Because it is machine washable, it is easy to take care of and pack away between uses. No separate, expensive trip to the dry cleaner required! While this sleeping bag may not be the best choice for sub-zero temperatures, it is ideal for camping in any season. With temperature ratings down to 42 degrees Fahrenheit, this sleeping bag is ideal for a couple looking to cozy up on their next camping trip. It easy to carry, take care of, and stow, making it an ideal option for both the budget- and space-conscious camper. If you’re looking for an inexpensive, high-quality double sleeping bag, this is one of the best sleeping bags you can buy.